"Because Heart Attack is like an earthquake. It can be years in the making and hit without warning. Yet unlike an earthquake a heart attack can be prevented and if it is attacked already it can be restricted from further attacks"
What is Declog Therapy ? 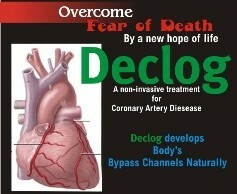 Declog Therapy is a non invasive, non surgical, 100% safe therapy that can prevent heart conditions; and reverse hardening and clogging of arteries and veins. This therapy is especially effective for treating coronary artery disease which leads to heart attacks. How does Declog Therapy Work? Why I’ve not heard of this before? Dr. Rajendra Kumar has been practicing for 16 years, after graduating from Nehru Homeopathic Medical College. Disclaimers: Website provides information; therapy should not be administered by patients except under medical supervision.